VALENCIA, Venezuela — President Nicolas Maduro vowed that a band of anti-government fighters who attacked a Venezuelan army base will get the "maximum penalty" as his administration roots out his enemies. Troops killed two of the 20 intruders who slipped into the Paramacay base in the central city of Valencia early Sunday, apparently intent on fomenting a military uprising, Maduro said in his weekly broadcast on state television. One of the invaders was injured, seven captured and 10 got away, the embattled leader said. "We know where they are headed and all of our military and police force is deployed," Maduro said. He said he would ask for "the maximum penalty for those who participated in this terrorist attack." The attack came as Venezuela's controversial constitutional assembly is getting down to work, signaling in its initial decrees last week that delegates will target Maduro's foes as he had warned. The new assembly, whose powers supersede all other branches of government, voted to remove the nation's outspoken chief prosecutor Saturday. On Sunday, Maduro announced that a new "truth commission" created by the assembly had been installed to impose justice on those fueling the unrest that has wracked the country since early April. The constitutional assembly is expected to meet again Tuesday, while lawmakers in the opposition-controlled National Assembly scheduled their own session for Monday, vowing to continue fulfilling their responsibilities no matter what the assembly might do. Leaders of opposition groups, which boycotted the July 30 assembly election, called for renewed protests on Monday, though turnout at demonstrations has been sparse in recent days. Residents who live near the army base in Valencia attacked Sunday said they began hearing bursts of gunfire around 4:30 a.m.
A video showing more than a dozen men dressed in military fatigues, some carrying rifles, began circulating widely on social media around that time. In the recording, a man who identified himself as Capt. Juan Caguaripano said the men were members of the military who oppose Maduro's socialist government and called on military units to declare themselves in open rebellion. "This is not a coup d'etat," the man said. "This is a civic and military action to re-establish the constitutional order." Maduro said 20 men entered the base and managed to reach the weapons depot undetected, but then an alarm sounded alerting troops to the incursion. He said 10 of the invaders fled, some carrying off arms, while those left behind exchanged gunfire with soldiers until about 8 a.m. before all were either killed or captured. "Today we had to defeat terrorism with bullets," Maduro said. Nearby residents who saw the dissident group's video online gathered around the military base chanting "Freedom!" Other protests also emerged around Valencia into the afternoon. 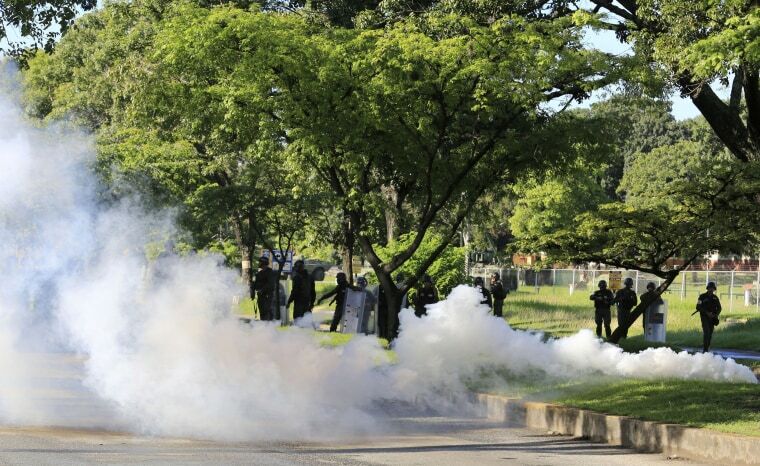 Troops dispersed protesters with tear gas and a man was fatally shot at a demonstration less than a mile from the base, said Haydee Franco, coordinating secretary of the opposition Progressive Advance party. More than 120 people have been reported killed in four months of unrest that has been fueled by anger at the socialist government over food shortages, soaring inflation and high crime. Defense Minister Vladimir Padrino Lopez characterized the attackers as a "paramilitary" expedition, saying the intruders were civilians dressed in uniforms. He did not identify any of the participants, but said they included a lieutenant who had abandoned his post. He said the man who recorded the video was a former officer dismissed three years ago after being charged with rebellion and betraying the homeland. In 2014, Caguaripano released a 12-minute video denouncing Maduro during a previous wave of anti-government unrest. He later reportedly sought exile after a military tribunal ordered his arrest, appearing in an interview on CNN en Espanol to draw attention to what he said was discontent within military ranks. Venezuela's latest bout of political unrest erupted in protest to a Supreme Court decision in late March ordering the National Assembly dissolved. Although the order was quickly lifted, near-daily demonstrations snowballed into a general protest calling for a new presidential election. Opposition leaders have urged the military, which historically has served as an arbiter of Venezuela's political disputes, to break with Maduro over what his foes consider violations of the constitution. But the president is believed to still have the military's support. Like Sunday's uprising, most manifestations of dissent among troops have been small and isolated so far. "It's still very hard to know to what extent there are significant divisions within the military," Michael Shifter, president of the Washington-based Inter-American Dialogue, said recently.